Kanon shares that she doesn’t have a good association with Santa, so much so that she has sad memories attached to him. Sadly, he hasn’t come since 1st grade for Kanon. She started thinking “Well, Santa really isn’t coming anymore, huh?” after a few years without Santa. She explains she would feel gloomy in elementary school because her classmates would talk about what they got, but Kanon wouldn’t have anything to share with them. Now, however, because Morning Musume always has Christmas events she doesn’t feel so sad about it. At last years event, Kanon got to sing “Wa~ Merry Pin X’mas” with Sayumi. Kanon considers this as a gift from the gods as she was very happy to get the chance to sing with Sayumi. It was new for her to sing such a cute song as well. These new positive memories have taken the place of the sad ones Kanon previously had, so Christmas is something to look forward to now. There is a Christmas event this year too and she is sure she will have a lot of fun at the event. November is the season of school festivals, and while Kumai-san regrets not being able to attend nearly any of the ones were held during her high school days, she’s happy that nowadays Berryz gets invited to perform at these festivals quite often. This lets them meet more people who don’t usually come to their concerts: at the latest such performance they did, there were what Kumai-san guesses were just these little kids from the nearby neighborhood. She waved to one of them, but they got embarrassed and instantly looked away. Kumai-san thought this was really cute. We’re a couple of days away from the release of Berryz Koubou’s final single, so Chii asks Kumai-chan what she thinks are the highlights fans should pay special attention to on these songs. To start off, Kumai-san thinks “Romance wo Katatte” isn’t very Berryz-like — in a good way. To her it feels more like the type of song they usually get as B-sides or album songs, and it’s almost like the cute songs always went to S/mileage or °C-ute instead. The music video, too, shows them in more natural makeup than usual. 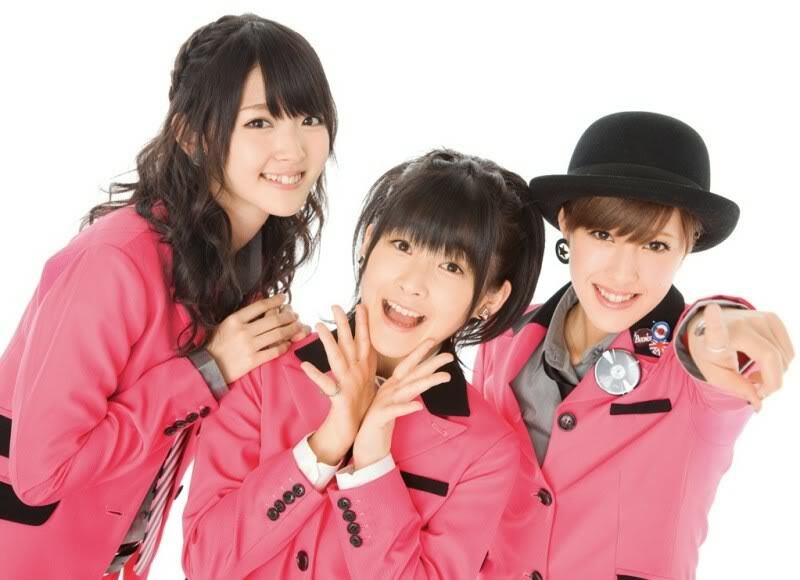 So Kumai-san recommends checking out the music video, too: you’ll be able to see a more fresh Berryz Koubou. Chii was surprised to learn what the title of the song. Coming right after the more intense song titles like “1oku 3zenman Sou Diet Oukoku” and “Futsuu, Idol 1nen Yatterannai Desho! ?”, she was sure the next one was going to be something equally as crazy. Still, she’s happy they got to show a new side of themselves on their very last single. As for “Towa no Uta,” Chii points out that in its music video they got to wear checkered outfits, just like they did in their debut single. Above all, though, the two think the lyrics are amazing, and Chii found herself becoming a bit sad during the shoot when she realized it was going to be their last music video. November 3rd is Culture Day in Japan, and Chii asks Kumai-san what the word “culture” first brings to her mind. For Kumai-san, it’d have to be art. She doesn’t visit galleries or museums that much, but she does have a favorite style of art: trick art. A while back she actually had a blast visiting a trick art museum in Yokohama. Chii thinks she might like to go, too, and Kumai-san highly recommends it. 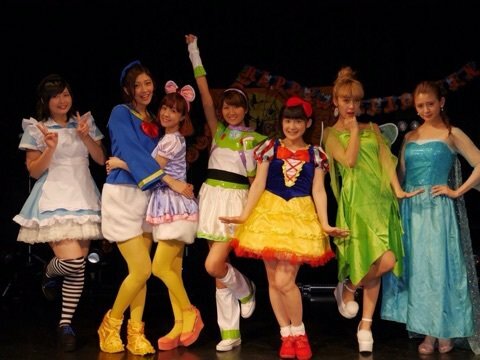 Berryz Koubou’s final concert tour just started a couple of weeks ago. Kumai-san points out that it’s actually their first autumn tour in four years, and above all it’s just been really, really fun. But she’s actually noticed her age catching up to her on this tour: sure, performing two concerts a day has always been tiring, but now it’s started to affect her in all sorts of new ways. Nowadays, performing concerts makes her whole body hurt — long gone are the days when she could dance without a care in the world like the Kenshuusei girls now. Chii doesn’t experience any muscle pain or such, but she finds that she has to put in more time for mental preparation to be able to pull off the two performances a day — how you feel mentally also affects how you feel physically. Chii recommends that Kumai-san, too, instead of thinking “oh dear, I’ve gotten so old,” she should phrase it like “I sure have grown up!” It’s all about that positive mental attitude. Momoko announces that the day after the show, December 21st, would be ‘Enkyori Ren’ai no Hi‘ – ‘Long-distance relationship day’. It’s a day for long-distance couples to reaffirm their relationship before Christmas (Airi: ‘Christmas should be sufficient though‘). The girls do find it a tad unreasonable that these couples can’t wait the three, four days until Christmas. The discussion spills over to them talking about the proliferation of couples in town during this period of time – all flirting here and there. Momoko: Please, think about where you are. Momoko thinks that there are quite a lot. Firstly, Yo-kai Watch. Miyabi comments that it feels like all the toy stores are inundated with Yo-Kai watch products. Not just the medals, but even the capsule toys seem to get sold out. It’s similar to the Pokemon boom of their childhood days, though the girls don’t really know the names of the characters. However, they are familiar with the sight of the series’ mascot, the orange cat Jibanyan. The series’ Pikachu, if you will. Momoko seems to be the resident expert, which is attributed to her involvement with the kids programme OhaStar. Lately, because the Morning Musume tour is over, on Saturday and Sunday they have been doing handshake events (She seems to be talking about the “long handshake” events the members have wrote about on their blogs recently, where I guess fans get a longer time to talk to members). Kanon explains that they are from morning to night and they do about 8 handshakes per hour. Because of that she is able to talk to everyone more often than normal. Apparently, many of the people who talked with her at the handshake talked to her about this radio show and expressed their opinions about it. However, the number one thing she was told was “You’re talking a bit slow, Kanon-chan”. She says that she is really nervous at handshake events so she was definitely talking slower. She still thinks she isn’t good at talking by herself, and thinks that talking by yourself is still really scary; because of that she will get quiet during the handshakes and think “what should I say” and the like. In the end, Kanon is really just thinking very hard about what she says before she says it, therefore, she talks slowly. She explains that she is the same way with her blog, writing what’s on her mind doesn’t come naturally. Although, she says, she seems to blog a lot about food. Song: Morning Musume – Nani wa Tomo Are! Momoko announces that December 13th is ‘Biyoushitsu no Hi‘, or ‘Hairdresser’s day’. She points out that a lot of events occur in December, so lots of people visit the hairdresser’s to prepare for things like dates on Christmas or just to get refreshed to greet the new year. Miyabi loves going to the hairdresser’s, and Momoko comments that she seems to go once every two weeks. Miyabi agrees – she drops by the hairdresser’s quite often, whenever she has free time (Airi: ‘Every time we meet, it feels like your hair’s changed‘). In fact, even as they’re recording, she feels like going to the hairdresser. Momoko, however, isn’t a big fan of hairdressers. She may drop into one about once in a half a year (Miyabi: ‘Isn’t that bad?’ Airi: ‘That’s pretty bad‘). Asking the others if they like to chat with their hairdressers, they reply that it depends on the the person doing their hair – they’ll talk if the hairdresser is chatty, and keep quiet if they aren’t. For Miyabi, if she doesn’t feel like talking, she’ll feign sleep. Momoko’s all right if it’s chatting when her hair’s getting cut, but she’s really bad when it comes to talking while she’s getting shampooed. Airi reveals that when she’s getting shampooed, she uses her nose to move the gauze, where it could end up in a position that allows her to peek. The others find this horrible and in bad taste, and you don’t actually want to see anything, right? Airi admits that it isn’t like she wants to peek. From since she was small, she really likes the feeling of the gauze coming loose (Momoko: ‘I don’t get you~ That quite the obsession‘). Momoko notes that if you accidentally raise your neck, it gets pretty loose and becomes pretty uncomfortable at the nose and mouth regions. Airi declares that having the chin exposed is all right, and you can use your chin to stop the gauze from dropping (Momoko: ‘My gauze technique still isn’t at that level‘). Airi’s familiar with her hairdresser, having been a regular from when she was small, and her hairdresser asks her to stop it when she does these things. Airi finds it fun, but also adds that you can’t let the whole thing fall off. You have to make just loose enough that you don’t get exposed. . She tries explaining it further, but Momoko’s already completely lost. 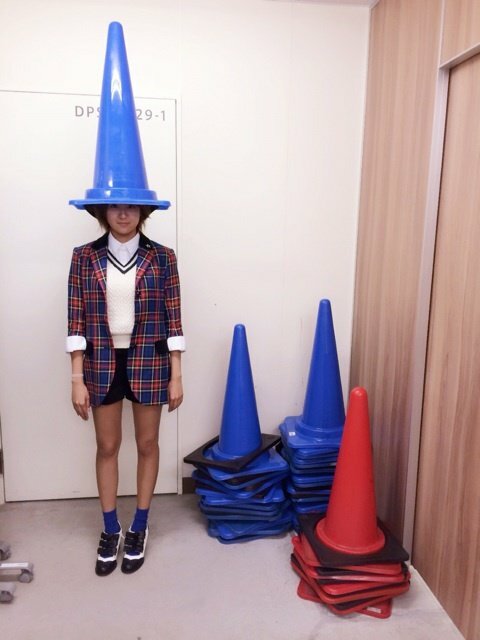 Airi: I should probably quit this before people start thinking I’m weird. Momoko: Don’t worry, don’t worry, you’re plenty weird already. Chii claims she kind of predicted that Makino-chan would be joining Morning Musume. She remembers seeing her back during the summer Hello!Con, constantly making eye contact with her seniors and quite simply “shining” — Chii could already tell back then that Makino was an exceptional girl. Kumai-san noticed this, too, and says she has the kind of eyes that once you look at them, it’s impossible to look away. Chii points out that it’s rare for Kumai-san to say that kind of thing about anyone. The two have high hopes for Haga-san, too, considering her Kenshuusei past. Next up is Ogata-san, or the “Mao-chan of H!P” as Chii puts it. The two talk about how there haven’t been that many girls in H!P so far who’ve had something they could say they were really good at, and they think especially Ogata-san’s figure skating is a first. No one in Berryz has any talent like that; some would say they played the piano or were good at swimming back when they were still kids, but these days, they have nothing. “So I really feel thankful from the bottom of my heart for having been able to join Berryz Koubou,” Chii sums up. “And then there’s my rival: Nonaka-san.” With this girl having lived in the States, Chii says Nonaka-san is pretty much on the same level of English proficiency as her. But in all seriousness, Chii heard Nonaka-san’s self-introduction at Budokan and she thought her English was so good, she had no idea what she was even saying. She found her to be in a completely different league altogether, and thus she considers her to be a serious rival. Meimi got her wish last week, and this week, Kananan is getting her wish of two very special guests joining them in the studio for their 100th broadcast. Kananan: I’m pretty cute, but these two surpass even me in cuteness, and while it is honestly killing me inside, I will greet them with a smile as best I can. Of course, she’s referring to the other two of the three top beauties in Japan, Takechan and Rinapuu, who introduce themselves in their most adorable voices. Meimi starts to speak in the same adorable voice but then she remembers that she is not one of the three top beauties and goes back to normal. Takechan interrupts with a high-pitched, “Wait a minute!” but Meimi tells her to speak up because she can’t understand her. Takechan just yells louder in the same pitch and we get nowhere. Meimi: But wait, what’s wrong? Meimi: Wait, I’m not talking to all of you. Takeuchi Akari-chan, why did you say, “wait a minute”? Takechan: Oh, yeah, well, it’s just a fun show. Meimi begins to get frustrated as the the three top beauties ramble on about nothing and asks them to speak so that the listeners can actually understand what’s going on, what is wrong with you guys. Takechan sees no problem here. Kananan says that the only thing wrong so far has been her thinking that she was the cutest in the group when in reality it’s Rinapuu, obviously. Meimi says she’s starting to feel like a babysitter, which only makes the other three get louder. Rinapuu points out that before they promised that they’d come on really strong this show and they’re doing just that. Meimi pleads that the promise is less important than showing some unity and cohesiveness with the script, instead of the weird insanity that the show is currently, but the others argue that the charm of 2nd gen is their weird insanity. They urge Meimi to play along and have fun but she is too concerned about the state of the show to let loose. Ugh, this is why you will never be a top beauty, Meimi.